Three thoughts on the Utah Jazz’s 103-88 loss to the Denver Nuggets from Salt Lake Tribune beat writer, Andy Larsen. It seems silly, but for me, the number one takeaway of this game is this: the Jazz dodged bullets on Saturday night like Neo in The Matrix. Several times, the Jazz’s players picked up knocks that it seemed could have impacted their upcoming schedule. The biggest injury was Donovan Mitchell’s, who went down after a drive and didn’t put any weight on his leg as he left the court. At first, there was a lot of confusion, and the first few camera angles on the replay didn’t show a twist of the ankle, maybe pointing towards a more dangerous Achilles injury. But then the baseline angle came (1:35 below), and showed that Mitchell put weight on his ankle as he landed. Somehow, Mitchell quickly had his ankle taped and came back just a few minutes later, and in the mean time, a 5-point Denver lead had ballooned to 13. His wasn’t the only one, though. Dante Exum had to leave the court after running into Jazz draft pick Trey Lyles with his right shoulder. While it wasn’t his surgically repaired left, it still was a scary moment, given how many games Exum’s missed in his career. But they ran tests on Exum’s shoulder, and he was diagnosed with just shoulder soreness. At other points in the game, Joe Ingles and Rudy Gobert had knee-to-knee contact with other players, causing them to come up limping. They didn’t have to leave the contest as a result of their injuries, but I wonder if subpar performances after that were caused, in part, by the bumps they’d taken earlier. This always felt like a schedule loss for the Jazz: a back-to-back, heading into Denver, meant that the Jazz didn’t get in their beds until 2 AM last night. Denver has had a fantastic early start to the season. The schedule loss happened the way it usually does: the team started strong through three quarters, then faded in the fourth, missing shots they’d normally make. But longer-term injuries would have made this loss worth more than just one in the standings. While the Jazz didn’t come away with the win, it could have been much, much worse. You may remember Friday night’s Triple Team, in which I made pretty clear that the reason for the Jazz’s loss against Memphis was their lackluster individual and team defense. The Jazz’s defensive performance against the Nuggets was much better. 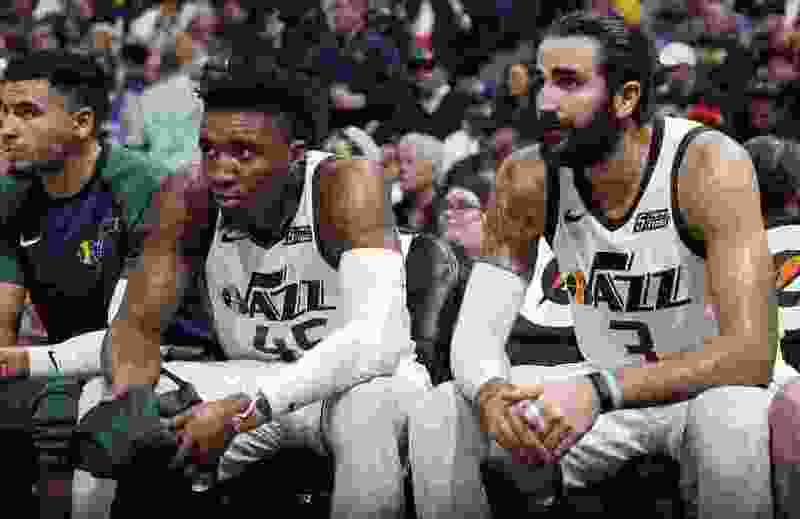 Perhaps looking to get his team involved and engaged in defensive possessions, Jazz head coach Quin Snyder had his team play a much more aggressive style of defense on Saturday, playing high up on screens, getting in the face of Nikola Jokic, and generally making life much more difficult for the Nuggets. It worked. The Jazz held the high-powered Nuggets to 106 points per 100 possessions, their second-lowest offensive performance of the season so far. The Jazz also picked up 12 steals, including five from Mitchell and four from Rubio. Both players did an excellent job of staying in the passing lanes that Denver likes to use, keeping their hands in play as they tracked Denver’s runners. Jae Crowder also deserves a ton of credit for his performance: he was everywhere tonight on the defensive end picking up loose balls and causing havoc. I thought it was also interesting how lineup-dependent the Jazz’s defensive performance was. 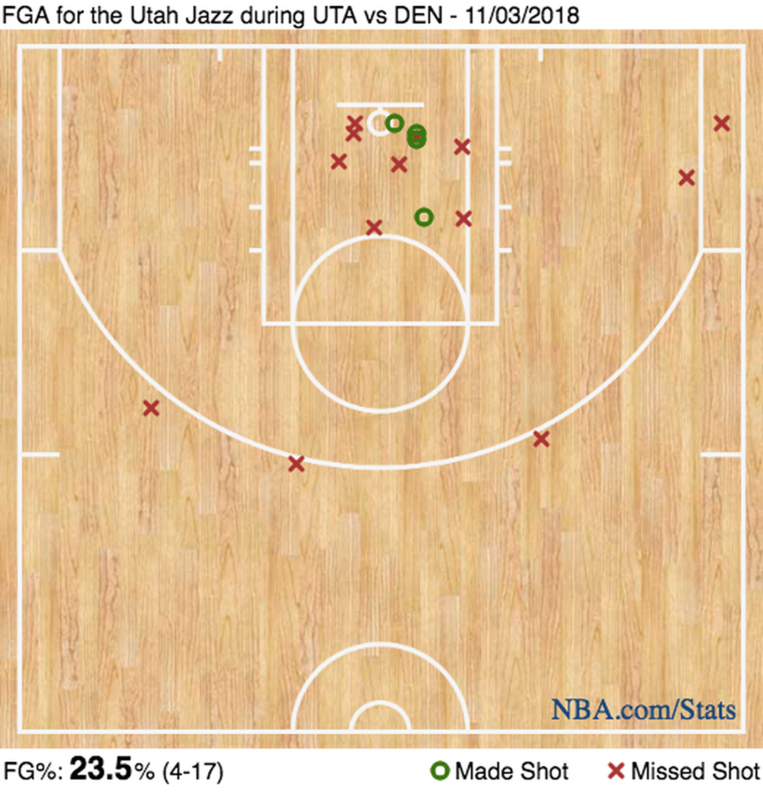 In 27 minutes where the Jazz played Crowder and Gobert together at the four and five, the Jazz allowed only 91.5 points per 100 possessions. Meanwhile, when Derrick Favors was in the game, the Jazz allowed 125 points per 100 possessions; 116 when it was both Favors and Gobert. The Nuggets fourth-quarter run came when the Jazz had to sit Gobert after playing him in the entire third quarter. Truthfully, conceptually, the Nuggets should be one of the teams that the two-big Jazz should be able to hang with: they play a lot of lineups with both Mason Plumlee and Nikola Jokic out there, and even when they play small-ish, the power forwards are Paul Millsap and Trey Lyles, both of whom Favors is very familiar with. Favors did look much springier on offense Saturday night, but still, the Jazz missed Crowder’s 3-point shooting and defensive disruption when he wasn’t in the game. Crowder’s been one of the most consistent Jazzmen so far, and the Jazz would do well to get him in the lineup as much as possible when he’s playing the way he is right now. So despite the loss, I feel pretty comfortable with what happened in that game. The Jazz got much closer to their identity defensively. Offensively, played well but were hurt by tired/injured legs that were missing layups, free-throws, and threes at the end of the game. Given that, let’s use the third point of the Triple Team to highlight a nifty piece of scouting and playcalling by the Jazz’s coaching staff. In particular, Mitchell finished his first half off with this layup at the rim. How did it unfold? It’s the last play of the half, and normally, the Jazz would have Mitchell running things up top just trying to create in the last few seconds with a pick and roll. But this time, they put Mitchell in the corner, with Rubio creating. Why? Because the Jazz noticed while scouting the Nuggets that they like to do something called “pre-switching.” Here’s the idea: The Jazz want to execute the play in the final few seconds, giving the Nuggets no time to score on the other end. In those late shot clock situations, the Nuggets switch pick and rolls, betting on containing penetration and making Rubio beat the switch. And because the Nuggets know they’re going to switch when Gobert goes to set the screen, they do something called a “pre-switch,” which means a wing (Torrey Craig) goes up with Gobert. That way, Rubio can’t exploit Plumlee on the perimeter with the ball. But as soon as Ricky Rubio sees the Nuggets do this switch, he fires a fastball to Mitchell in the corner. Then, Plumlee has to rotate out, and Mitchell can attack downhill against a stumbling, bumbling big man. That’s easy money. So just to conclude, the Jazz made an adjustment (Mitchell in the corner) to combat a Nuggets adjustment (pre-switching) that counters a typical strategy used (attacking the big on a switch up top) against the Nuggets' gameplan (late shot-clock switching) that was needed because they knew what the Jazz wanted to do (attack late in the clock). The NBA isn’t checkers, it’s chess.